In your blender combine everything with 1/2 cup water. Blend it till it’s nice and smooth. You might need to add more water. You want it to be like thick pancake batter. Leave it in the blender to sit while you prepare everything else. Slice the potato in half lengthwise. Slice that half in half lengthwise. Cut it into 1/4 inch slices, widthwise. Coat with a few tablespoons olive oil, a bit of smoked paprika and a pinch of sage. Spread on a baking sheet and cook at (preheated) 425 for about half an hour to 40 minutes, till they’re dark and browned and crispy. Turn them every once in a while to make sure they don’t stick to the sheet, and to make sure they get crispy all over. In a medium sized soup pot, bring some salted water to a boil. Drop the broccoli rabe in, and bring back to a boil. Cook for five minutes, till it’s bright green but wilted. Drain. Cool, Chop. In a large skillet over medium heat, warm the olive oil. Add the garlic and red pepper. Add the broccoli rabe and tomatoes. Cook for a few minutes till everything is hot through, and the tomatoes start to wilt. Add the balsamic and butter, and season with salt and pepper. Transfer to a serving bowl. Heat a skillet till it’s quite hot. Melt a little butter on, and put about 1/2 cup of batter on with a ladle. Use the back of the ladle, in a circular motion from the center outwards, to spread the batter to be about 1/4 inch thick. Cook till it’s browned on one side, then flip and cook till it’s starting to brown on the other. Grate about 2 cups of mozzarella into a bowl. Serve the crepes, broccoli rabe, potatoes, and a lightly dressed salad, and let people arrange it any way they like. And that’s it! 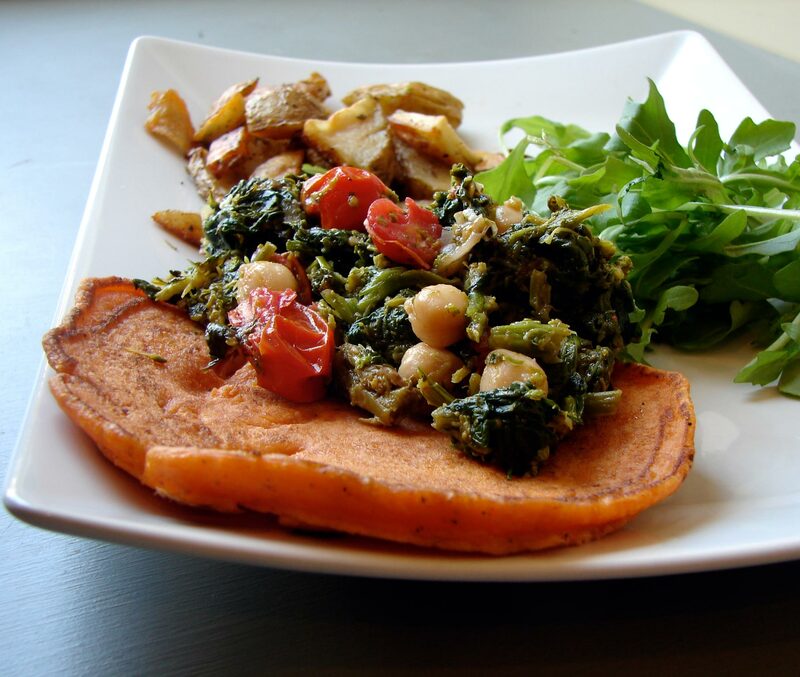 This entry was posted in beans, potatoes, recipe, tomatoes, Uncategorized, vegetable side dish and tagged broccoli rabe, chickpeas, potatoes, roasted red peppers, sage, semolina crepes, smoked paprika by Claire. Bookmark the permalink.